There are new updates that have been added at the bottom of this story…. Nearly a couple of months after announcing a complete ban on adult content, Tumblr has made another major change. No, it’s not related to the content this time. Instead it’s about the look and feel of the platform. In a staff post titled ‘Tumblr is getting a facelift‘, the company announced the switch to a new look is being done to stay inline with the Web Accessibility Initiative of the World Wide Web Consortium. Well, Tumblr says the result of this weeks-long effort means inaccessible menus are now more accessible, poorly described elements have been fixed, and increased overall readability. Head here to learn more about these changes specifically. The company shared an animated gif showing the new dashboard look. See that here. The company, however, admits this new dashboard look negatively impacts the bluespace art that users have created for many years now. Sadly, Tumblr says there’s no workaround for that. This new update has started rolling out slowly, and should be available to all Tumblr users in days to come. Are users happy with the facelift? This is the kind of change that drives users nuts. They do it with zero input or warning, they only speak up after they've rolled out the change. It's also both subtle and noticeable, so like, it certainly made ME feel anxious, like am I hallucinating? What's different? But like, they should have hired an accessibility consultant. They just need to stop half assing things for very bad attempts at being PC and hip or whatever their motivations are. This goes right with bad AI programming for the damn ban. Terrible update, you can't look at your dash for more than a couple of seconds without getting a headache. Bless x-kit people for saving our eyes and sanity. It's the worst thing they have done, it makes my eyes hurt and gave me a headache when I logged on this morning. Tumblr changed their background colour to dark blue for "accessibility". Only they forgot about their GDPR consent page. Now illegible. Yes, same Tumblr that filtered out its own "acceptable" example images. And which put a GDPR HTML wall in front of RSS feeds. Anyway, what do you think of this new update? Let us know in the comments section below. How to revert to the old blue? If you take a look at social media platforms, especially Twitter, you’ll see the number of those who aren’t happy with this color change is far higher than those who are happy with the new update. If you are among the former lot, you’ll be glad to know there’s a way to revert to the old blue layout. there's an xkit extention to fix it, at least. In case you aren’t aware of xkit, you can learn more about it here. Check out our latest story related to this update. 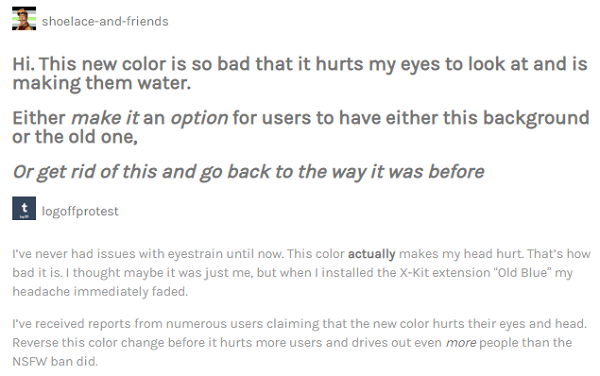 It’s titled “My eyes hurt” – New Tumblr UI update gets thumbs down from lot of users. NOTE: PiunikaWeb has covered in detail the Tumblr adult content ban as well as the platform’s alternatives, check out all updates here.